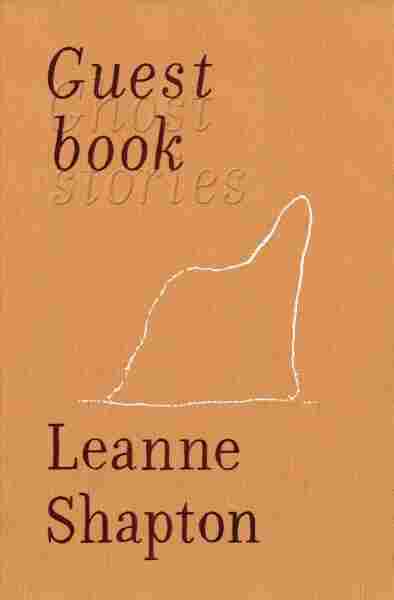 Book Review, 'Guestbook,' By Leanne Shapton Leanne Shapton's new short story collection feels like walking through an art gallery, each piece linked in ways that are ineffable but clear. And many sections use artwork, including Shapton's own. Leanne Shapton is an artist of the mundane. Her books mix writing, prose collage, photography and watercolor to imbue familiar objects and dull routines with mystery and emotional weight. In her 2012 memoir Swimming Studies, Shapton transformed pools and swimsuits into representations of her past selves. In 2014's Women in Clothes, she and co-editors Heidi Julavits and Sheila Heti turned hundreds of interviews and images into a monumental reflection on self-presentation. Her latest project, Guestbook, borrows techniques from both. This time, however, her subject is ghosts. Guestbook is not exactly a book of ghost stories, though its subtitle disagrees. It behaves more like a short story collection than any other literary form, but reading it feels akin to walking through an art exhibit, each piece linked in ways that are ineffable but clear. And many of Guestbook's sections are art. Shapton includes many of her own watercolors and uses photographs as both art and documentation. In "Billy Byron," she uses staged pictures as supporting evidence in the story of a haunted tennis player; in "At the Foot of the Bed," the haunting comes through pictures alone. Few of the hauntings in Guestbook are described as such. Shapton does include a few conventional ghost stories, such as "Patricia Lake," in which the narrator's friend describes a visitation: "He told me that suddenly she was there and they had been talking for some time. They were in his studio apartment, and though he couldn't exactly see her, she was there and seemed to be the same age as she'd been when she died." More frequently, however, Guestbook blurs the lines between haunting and reality. For instance, "S as in Sam, H, A, P as in Peter, T as in Tom, O, N as in Nancy" combines pictures of the titular figures with behavioral sketches that could describe either a living person or a ghost. Peter, for instance, is "methodical. He is the one who keeps her safe. He is the one who loves her and reassures her. He can be heard as the murmur of company in the living room." 'Guestbook' behaves more like a short story collection than any other literary form, but reading it feels akin to walking through an art exhibit, each piece linked in ways that are ineffable but clear. Guestbook has several sections in which an unnamed female character seeks love and reassurance. "Gymnopédies" combines floor plans with brief behavioral notes: "Asking where everyone is, including her deceased siblings;" "Rearranging her things repeatedly;" "Afraid to sleep because of fear of not waking up." The sick or unhappy female character never reappears, but after this point, Guestbook begins meditating more often on death. In "Sirena de Gali," online vintage shopping becomes a way to access dead family members. In "Natura Morta," which is Italian for still life but translates literally to dead nature, Shapton offers what look like old family photographs, accompanied only by number of social-media likes: tribute posts, the tribute excised. And in "Chrysanthemum, Carnation, Anemone, Foxglove," she pairs watercolored flowers with a reflection on photographs' capacity to make absence more acute. These sections serve to create a faint arc of decline, death and grief. Guestbook has no definite plot, but it would be possible to take it as a book of mourning. Certainly, Shapton suffuses both art and text with longing. But plenty of Guestbook's sections stand alone, whether as ghost stories, explorations of loneliness or demonstrations of human fragility. Among the strangest and best is "Eqalussuaq," which has three components: undersea photography, facts about the Greenland shark, and a cruise ship or yacht's fussy menu suggestions. While the humans above "would prefer French-Caribbean preparations or contemporary Italian (the River Café restaurant and cookbooks could be a good source)," the sharks below "feed on dead whales, tearing great mouthfuls out of their carcasses." "Eqalussuaq" is Shapton at her finest, as is Guestbook as a whole. Without fail, it's unexpected, subtle and moving. Shapton excels at evoking emotion through absence, which is, perhaps, a skill borrowed from more traditional ghost stories. Guestbook never sets out to frighten, though. Some of Shapton's ghosts might be malevolent — the haunted tennis player in "Billy Byron," for example, might have been better off without his supernatural coach — but there are no jump scares here. Instead, her ghosts are longed for, invited, or quizzically welcomed. Her protagonists tend to share the attitude of the woman in "Alcatraz" who goes to visit the former prison, then discovers that a spirit has followed her home. When it brushes her legs, she feels instant sorrow, but she understands that it seeks only "the sympathy she felt for the men who had been [in Alcatraz], sympathy it desperately wanted." She burns sage to make the spirit leave, but she never retracts her sympathy. Guestbook is a profoundly sympathetic work, and one filled with yearning. That yearning, like a ghost, lingers long after the stories are done.